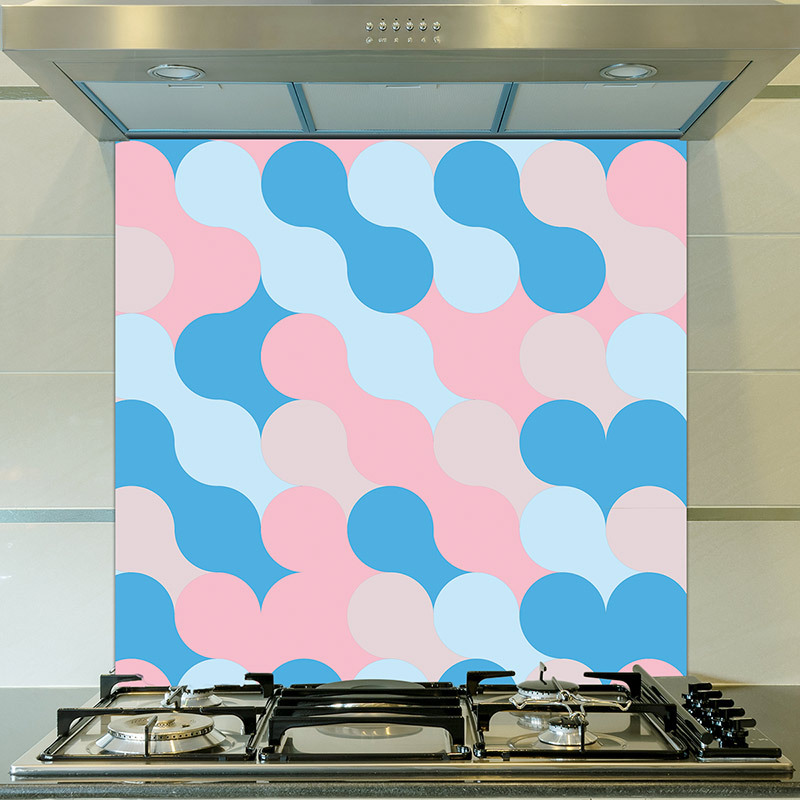 9 Coloured Glass Splashbacks To Add Oomph to Your Kitchen! Looking for something really special to show off your new kitchen? Bright and bold coloured glass splashbacks for the kitchen behind either the cooker or basin could be just the thing to add a real luxurious sparkle to the room. Simple to fit, custom made to measure and they are guaranteed to look great for years and years. As a thoroughly unique and modern way to reinvigorate a room, we think they’re pretty hard to beat in the bang for buck style stakes. Your space may be neutral, off-white or soft pastels – one of these beauties could really be your finishing touch. A modern splashback in just the right tone or hue to either compliment or contrast can help make your house the home everybody talks about! As we all know, colour can convey so many different emotions – there are whole sites dedicated to the psychology of what goes with where or why you should steer clear. Red equals fiery passion, vitality and energy. Orange creates a sense of excitement, happiness and warmth. Brown is proven to develop a sense of security, stability and reliability. In home décor, these same colour choices will affect us the moment we step over the threshold, take a look around and get that first impression. Expect pulses to start racing with deep reds or feel the love with smiley shades of cheery yellow! 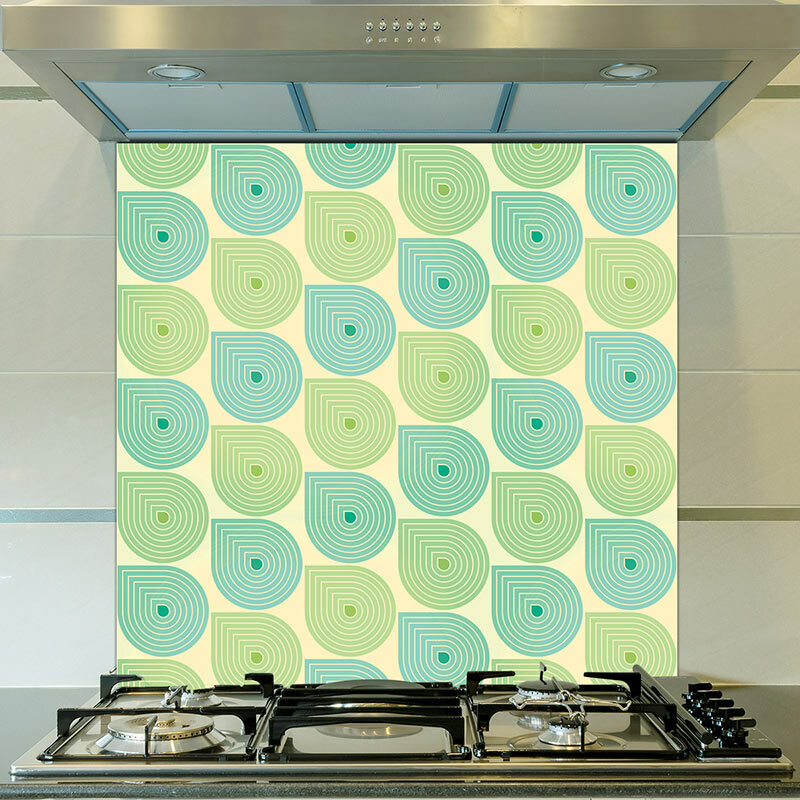 Colour options and ideas for cooker splashbacks can be sometimes overwhelming. We all need a little help now and again to get a little focus in our ideas. Luckily we created something to give a little nudge when the inspiration well is running dry. Our Room Hero was designed to help with ideas on finding colours and patterns within our growing ranges. Not just for glass splashback colours but for all the things we make. It works on the principle that we all have that first item that we’ve picked up which starts the cycle of updating our space. It might begin with a lamp, a rug or a cushion. Whatever it may be, it’s often the colour of it that created that initial creative spark. Room Hero works with the object (that item is the room hero!) and from there curiosity takes over: what’s its colour? What’s its style or what theme are you looking to develop? Are you looking for blue and got that shabby chic bug? Or orange and a more modern itch to scratch? 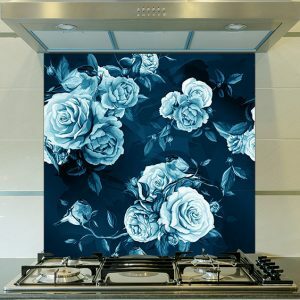 Whatever your style, Room Hero is there to help with inspirations and ideas for glass splashbacks for the kitchen and bathroom, Feature Tiles, wallpaper murals and our exclusive vinyl flooring. I had to start with what has just got to be the most effective colour for making a real statement in your room. 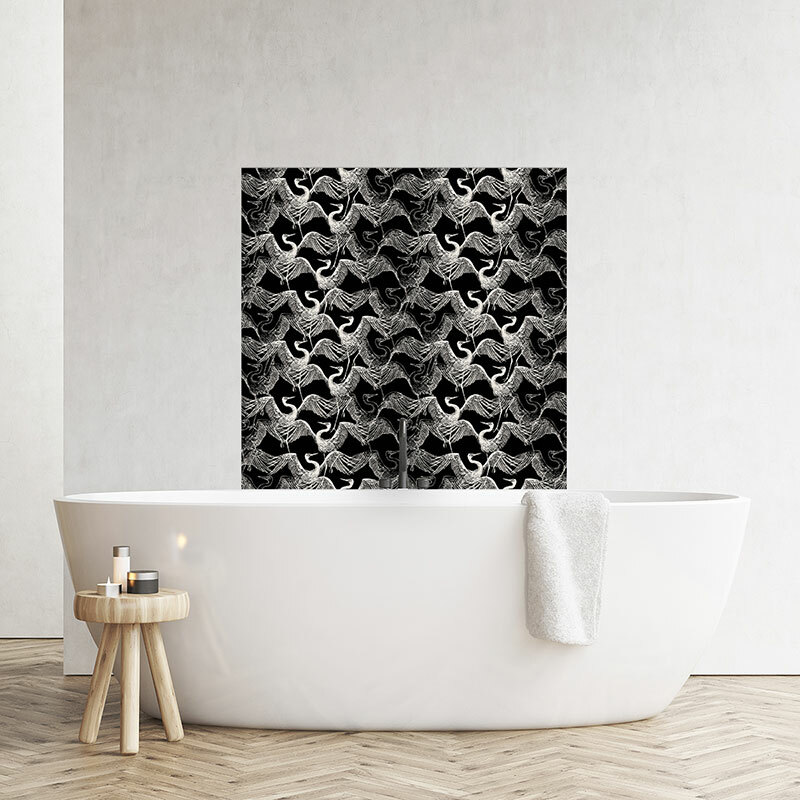 Black as a defining kitchen splashback colour or bathroom backsplash (try saying that fast….) looms large and luxurious! Printed on the reverse of our crystal clear glass, black shines through with a depth and clarity that literally takes the breath away. Let it shine as an accent colour to contrast against a white print. 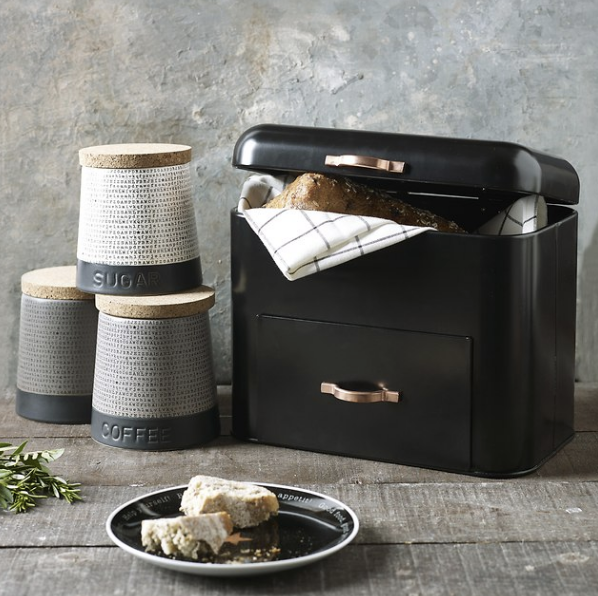 Black is guaranteed to turn heads and make your room the last word in modern kitchen style. Not just for coloured kitchen splashbacks, black is in abundance throughout the high street this season. I especially adore some of the earthenware and metal dining accessories available. Deep rich glossy blacks make for wonderful vinyl and leather chairs and stools. 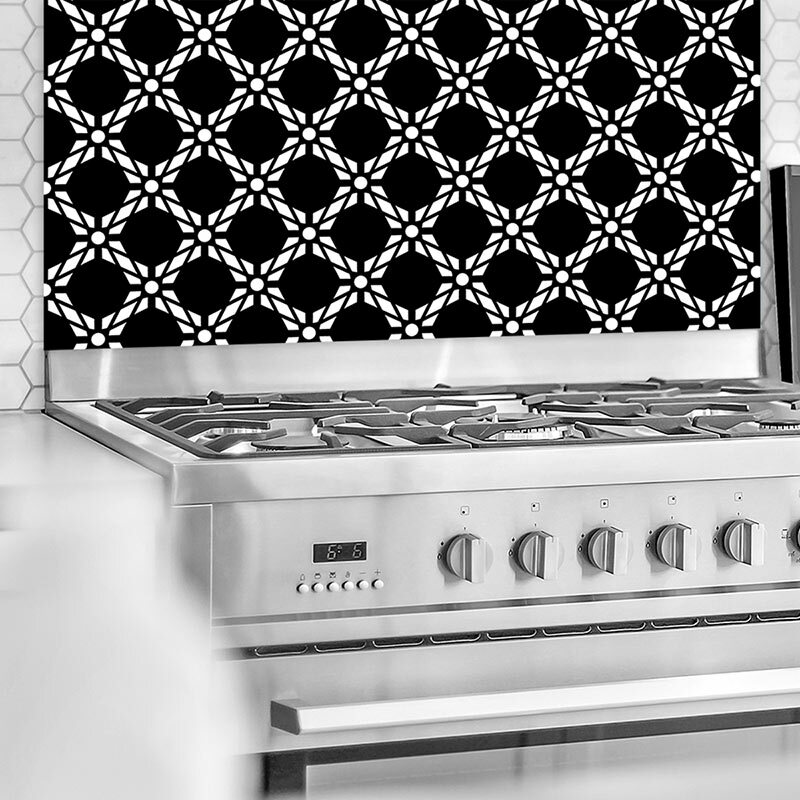 Be bold by using black in the kitchen to offset other more neutral or contrasting colours. It’ll look super stylish and keep on-trend for ages. White, like black, fits in with so many kitchen colour themes. 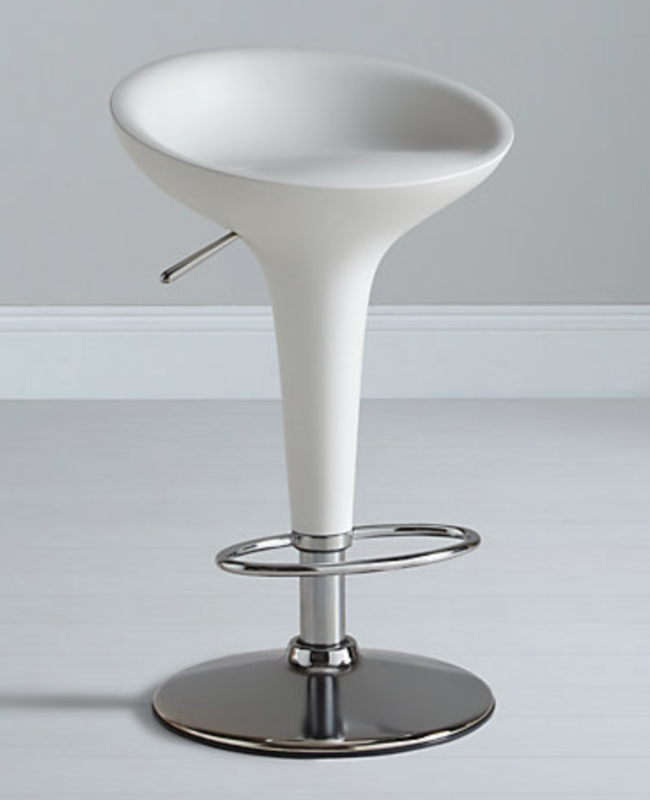 Use either as a neutral accent or by complimenting gentle pastels, white adds cool sophistication to your space. Grey or brown worktops, off-white and cream cupboards, even stone or granite, white holds your style together with ease. White can really be the colour that unites your space and within a brightly coloured splashback design, it can bring differing shades and hues closer together. 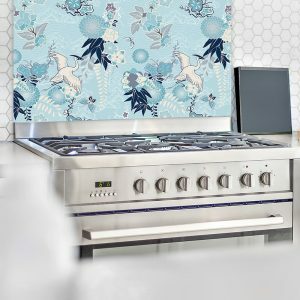 As a splashback colour, white looks fresh and inviting – a complimenting wink to a light-filled country or modern styled kitchen. 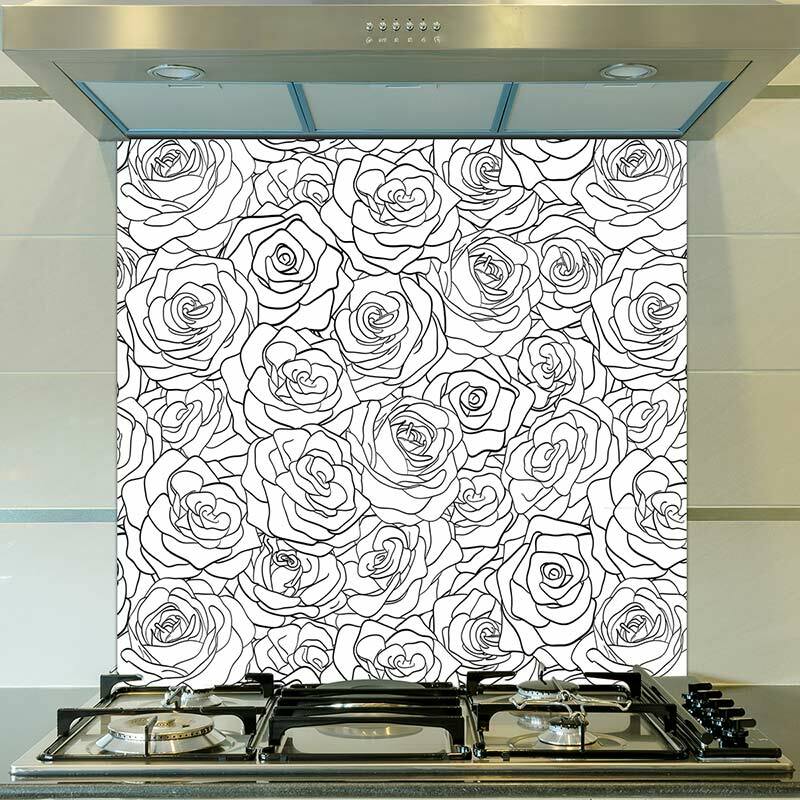 All our glass splashbacks and feature tiles are lovingly printed on the reverse so even when the colour palette is delicate and pale, they’ll never fade or blemish. On the high street and in the designer stores, white will always be a mainstay. You just can’t go wrong. Green gives me the feel of spring and the summer. Choose a different shade though and green slots right into autumn or even winter. Its seen as the most restful and peaceful colour of the spectrum – perfect for the kitchen where people unwind after a day at work. 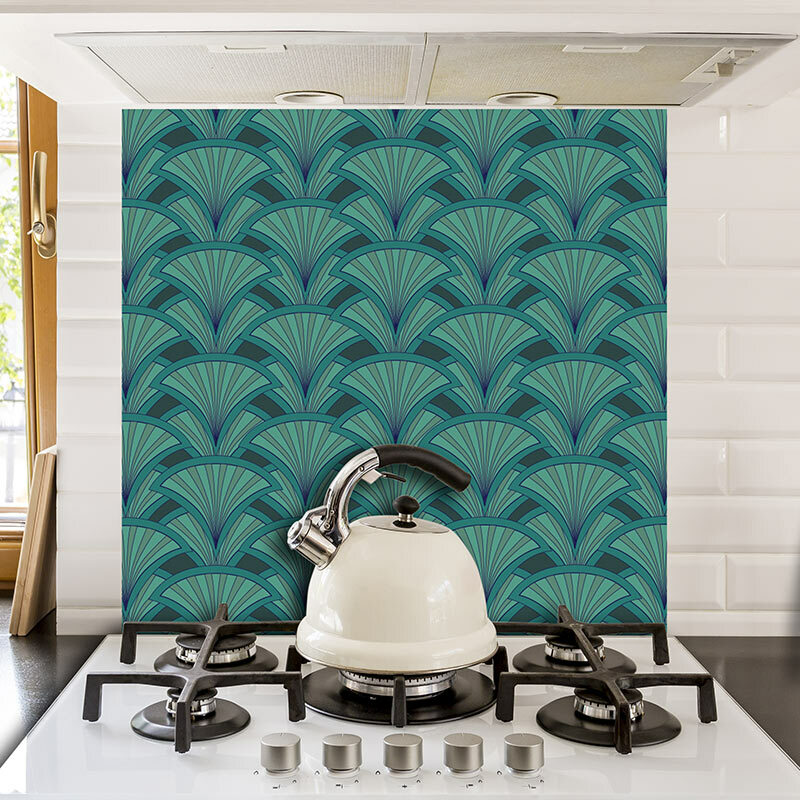 Pick the right splashback colour and work with green in differing tones throughout the room. Subtle changes in hue for the towels, curtains or blinds. Expect your neighbours to turn a little of the same colour with envy! Using green as the accent colour in your kitchen? 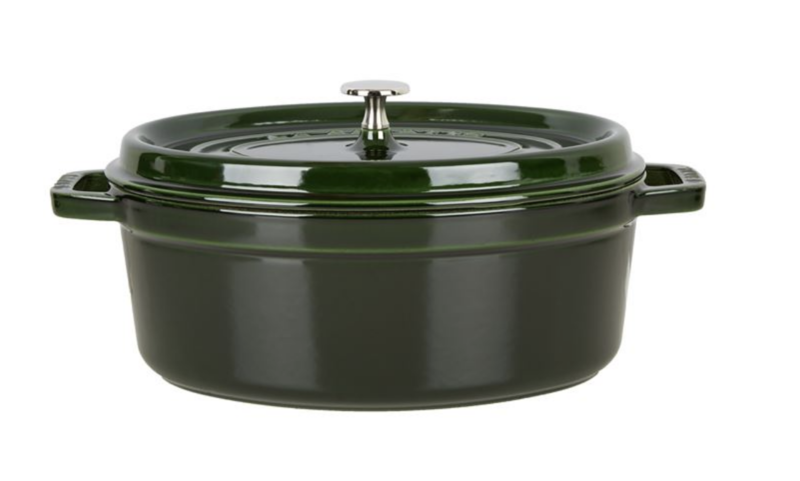 If looking to compliment, I love this Staub cast iron cookware. The exquisite deep green would be just fantastic matched with your unique coloured splashback. Different blues can change a room’s feel so much. Deep dark shades of blue or purple add an element of opulence and full-on luxury. Like cascading velvet drapes, rich colours reach out and demand attention. Sometimes this can be a little too much for the room, but other times, when you’re really looking for coloured glass splashbacks with panache…..it’s just irresistible! Paler blues create a clean crisp environment and feel fresh and contemporary. As a splashback colour, they add a nautical, even a scandi sense, and look totally shipshape when matched with a lighter worktop and cupboard colour. Hues of blues are where I’d start for splashback ideas in a white kitchen. 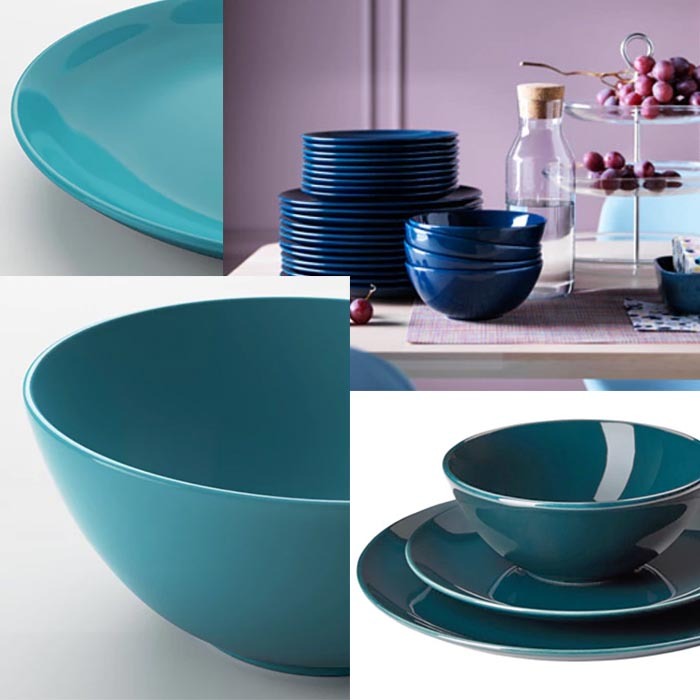 If you’re wining, dining or just plain nibbling in the kitchen, this Ikea bluey-turquoise dinnerware compliments, sparkles, and might be the perfect colour match for your new glass cooker splashback. Talk about the finishing touches! 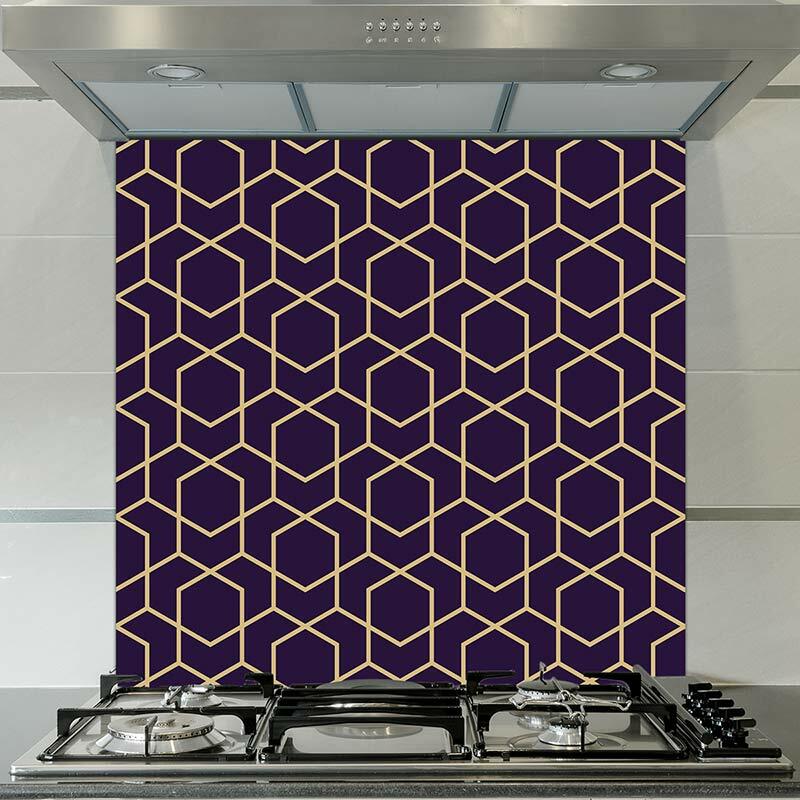 We know that you buy products like our vinyl flooring, wallpapers or coloured glass splashbacks once every few years and we know how important a decision they can be. That’s why we post articles like this to help take some of the guesswork out of finding your style. It’s why we produce samples wherever possible and why we answer any question as quickly and fully as possible. We know the high quality of what we produce so let us help you make the right decision. Need any more info? We’re all over social media – talk to us! Want to know what our customers think about our coloured glass splashbacks? 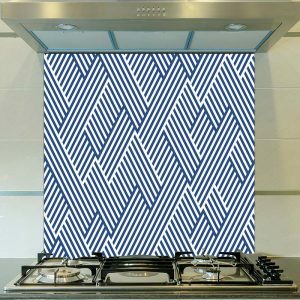 – have a look here at some of our recent backsplash reviews. For info on fitting, check out this simple how-to guide on installing your glass splashback. PS. We’re compiling a lookbook for interior inspiration 2018 (it includes wallpapers, flooring as well as more pattern ideas for splashbacks) We know you’ll fall in love with it! Add your email info below and it’ll be sent out as soon as its all finished and looking tip-top. Thanks for reading and remember: your home is unique. Don’t forget to show it! Victorian Vinyl Flooring – Traditional Designs Meet Modern Style! Why Wide Width Vinyl Flooring Works!